Last night we were fortunate enough – myself & Small, her little cousin The Divine Miss M and her BFF – to attend a preview 3D screening of Spielberg’s The BFG. Some reviews have claimed it didn’t translate well and if anything was ‘too faithful’ to Roald Dahl’s much-loved novel. I don’t need to explain the plot so will just comment on the movie. Well this family didn’t find it so. I think, if anything, it is because it is so faithful to the book that it works. Ruby Barnhill as Sophie is just the right kind of dorky to play the bespectacled orphan with pedantic tendencies who is plucked from her bedroom by a huge but kindly giant.Mark Rylance plays his part as the BFG with an endearing and appealing manner. The BFG’s fellow giants – gargantuan in size and vile in persona – are suitably ferocious but with enough comedic touches to render them less scary than might be supposed. If you are a Dahl fan you will approve and if you have young children there is nothing in this that would be too terrifying. Love the BFG’s cave/cottage and his room of dreams – and the ubiquitous snozzcumbers are truly revolting! A huge shout out to Dot Tonkin of Random House Australia for extending the invitation! It was a real high point in our holidays. Make sure you rush out to buy the new edition of the book. Our library will be featuring a Roald Dahl display following the holidays – and of course leading up to Roald Dahl Day in September. Those of us in tropical Queensland rarely, if ever, get to experience the High Country under its wintery blanket of snow. I was hoping to take Small there these holidays to visit friends, snow and wombats but alas! The expense of plane fares was too much for our budget. At least we will be able to have a vicarious experience as we follow a joyful young wombat gambolling and rolling in a very snowy expanse. Little ones will love the rhyming text (though I will be interested to see how many will predict that ‘bum’ will rhyme with ‘gums’!) which spreads over pages allowing plenty of opportunity to guess what is coming up next. Although the terrain may be unfamiliar to many children they will readily identify this as an Australian landscape with recognisable road signs and vegetation and animals. The endpapers are a gorgeous map of Wombat’s meandering and are going to be absolutely fabulous for my new unit with Year 3 looking at fictional maps! To my mind this is a must have both for those kids who live in this area (which it seems rarely features in children’s books) and also those who never get to put on a jumper! An absolute cracker of a read aloud with beautiful text and illustrations as well, I highly recommend it for readers of Prep age up to around Year 3 (or beyond!). A great little book for young readers around 4 years up that explores the differences but also the similarities between people. Two girls who live next door to each other are seemingly poles apart in their personalities and behaviours. One is restrained and tidy and organised although her dad is eccentric and colourful and wacky. The other is eccentric and colourful and wacky although her dad is restrained and tidy and organised. It would seem that never the twain will meet until one day both neighbours decide to build treehouses. While the dads may approach their process in very different ways each aided by their respective daughters who do likewise, the end results are both surprising and revealing! The vibrant illustrations and lavish use of colour and line add real liveliness to this book. Recommended for early readers around Prep upwards. Make no mistake – I beg to review each of Hervé’s books! And they never leave this house. My Small and Miss Mouse would miss them too much. They are re-read over and over each time with as much delight as the first time! The fun and magic continues with Let’s Play as readers are invited to join a winsome yellow spot in a play journey filled with loops and swirls, light and dark, colours and counting, jumping and hide-and-seek. Using the reader’s finger as a ‘driver’ the spot takes us on a wild adventurous romp, each page leading on to the next magical experience. Although they need no recommendation, I cannot endorse these enough for both your own shelves and your library shelves. Luckily their sturdy covers and high quality pages withstand all the repeated handlings of love! Read more about Hervé Tullet here. This is an absolute hoot of a book and I can’t wait to read it aloud (with Small in the house and Miss Mouse sleeping over, it will be a great opportunity this weekend)! If you’ve ever owned a puppy you will be all too familiar with the peccadilloes of Dash as his young owner shows him off and enjoys her beautiful pet. Dash is not a very good pupil at puppy school, is a bit slobbery and tends to make a mess (with help of course!) in the house but is very friendly and loves walkies time. When Dash goes missing everyone is out all night looking for him only to find that Dash has met another ‘dog’ up the road – PUPPIES! Now if you want to know what makes this so different from other dog stories, I’m not going to tell you. Suffice to say that when you see it, you will understand the hilarity! This is a prime example of illustrations adding far more meaning to the text. Highly recommended for little humans in need of a few chuckles! Once again Sunshine Coast author and illustrator Gregg Dreise has produced a sumptuous and vibrant take on traditional Aboriginal morality tales. Continuing with his series featuring birdlife Mad Magpie follows a theme of bullying and resilience. Drawing on inspiration from his Elders Gregg relates the story of a magpie called Guluu who is continually harassed and teased by butcher birds. Of course Guluu’s reactive defence of anger just does not impact on his tormentors and the plaguing continues. He consults his wise Elders seeking advice. Old Dinewah the emu, Bulul the mopoke owl and Gulayaali the pelican explain that being ‘tough and angry’ will not solve his problem. They advised him to stay calm like the water flowing in the river and to ignore the butcher birds. As so many others have found in similar circumstances this is not easy and Guluu continues to be frustrated and feel his anger rise. Until he decides to sing, just as he used to before he became so angry all the time. His loud birdsong completely drowns out the jeering of the bullies and they give up and fly away. Standing proud and alone Guluu demonstrates that just one can overcome many. In time even the butcher birds learn to sing and the community achieves a harmonious and bully-free life together. We can all learn from the lesson of Mad Magpie. Highly recommended for children from around the age of four upwards. If you have not seen Gregg’s other books do yourself a favour and seek them out. I have previously reviewed both Silly Birds and Kookoo Kookaburra and also warmly recommend them to you. With my Small’s proud Wiradjuri heritage these are all firm favourites in our home. Click on the image to read an article from First Nations Telegraph. 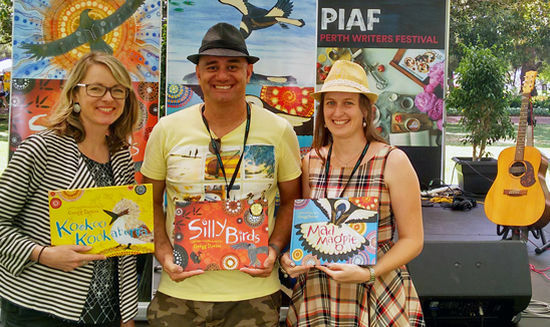 Are you an aspiring Indigenous writer, storyteller and or illustrator who wants to progress your professional development? Our Australian Indigenous Creator Scholarships might just be what you’re looking for. Get your application in for 2016 now. Submissions close 15th July. Magabala Books – Australia’s oldest independent Indigenous publishing house.